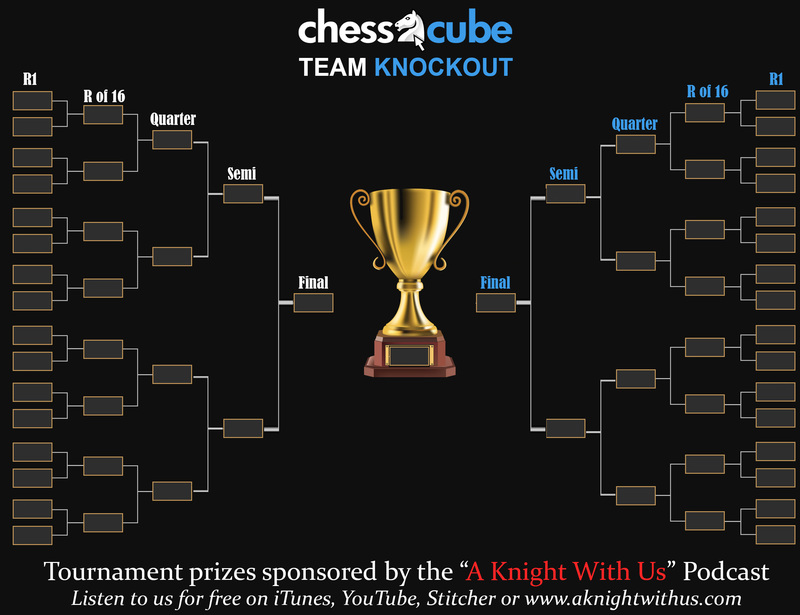 ChessCube Forums • View topic - ChessCube Team Knockout -- Entries Now Open! ChessCube Team Knockout -- Entries Now Open! The first quarterly ChessCube Team Knock-out tournament is now accepting teams for the event taking place between 16 February to 23 February, 2016. ENTRY IS FREE! Be the best Team on ChessCube! Get your team together, create a super team name, and put your design skills to the test by creating an amazing team emblem! ALL TEAMS - PLAYERS AND CAPTAINS, SHOULD JOIN THE TEAM TOURNAMENT CHAT ROOM ON CHESSCUBE. •	There will be 32 Teams entered into the ChessCube Team Knockout. If 32 teams do not enter, the tournament will start with 16 teams. •	A team will consist of 4 players exactly, no reserves. Each team must submit a team captain which must be a member of the team. •	The time control will be 3 minutes (unrated), with no time increment. •	Matches will take place between February 16 to February 23. The event calendar is graphically depicted below. •	Players must play in the order submitted to ChessCube. The order of the board numbers should be tournament or general rating based, whichever is highest. Each team captain should order their team based on this accordingly. •	The knockout consists of one match of 3 games per board. Board 1 of the higher seeded team will be white, and colors alternate from that. ALL games MUST be played since in the event of a tie on match points, game points will be used. (So even if you have won two games and have won your board match, you should play a third). A board match win will earn 1 point, a tie 0.5 points and a loss 0 points. ANY ABUSIVE BEHAVIOR INCLUDED BUT NOT LIMITED TO: SWEARING, OBSTRUCTING OR DISTURBING IN ANY WAY DURING A GAME IN PROGRESS, ACCEPTING OR ASKING FOR ASSISTANCE FROM OTHER PEOPLE AND/OR COMPUTER PROGRAMS MAY BE SANCTIONED BY THE CHESSCUBE MODERATORS WITH THE IMMEDIATE DISQUALIFICATION OF THE TEAM FROM THE TOURNAMENT AND PERMANENT BAN OF PLAYERS INVOLVED WITH CHEATING AND ABUSE. •	All players should join the CCTK Room in ChessCube. This will be a new room. •	All games will be played at a 3 minute time control; rated; 0 Cubit wager. •	Each match in the group will be played separately, however the games of a team VS team will take place at the same time. •	It’s recommended to add your opponent to your friends list in advance. Once the game is scheduled to take place, the WHITE player will challenge the opponent. •	If the game starts with the players in front of the wrong color pieces, please abort the game and start it again with the correct color pieces. •	In the event that a team player is not available 5 minutes after the match scheduled to start, that board will score 0 for the match. •	Team members must be ChessCube VIP account members OR at least have an XP Level of 100. Note: Players are not allowed to play in more than 1 team. Usernames on IP's will be checked in the case of the user having more than 1 username. Teams are allowed to give themselves a custom name. Team names may be changed up to 1 week before the start of the tournament. No in-tournament renaming will be allowed. Each team member will win 150 Crowns each PLUS 3 month VIP account/extention per member + each team member & reserve may request to gift a 1 month VIP account to any ChessCube user of their choice. Each team member will win 75 Crowns each PLUS 1 month VIP extension per member. View the Tournament Layout / Plan HERE. Note: Games must take place between 12PM GMT/UTC and 8PM GMT/UTC on these days. To ensure the smooth running of this tournament, the tournament organizers may change any of the rules at any time for any reason, with or without consultation of players involved. ChessCube cannot anticipate all of the different situations that can arise when coordinating a multi-nation team, multi-timezone, online competition - so needs the flexibility to amend rules as required. ALL players - please add your opponents to your friends list. CAPTAINS: Please confirm with the opponent captain as to when the game will be played. Once confirmed, please email us at [email protected] with the day and time in GMT/UTC. If you have any questions or need clarification about the tournament in general, please contact [email protected]. Re: ChessCube Team Knockout -- Entries Now Open! MF doesn't "most fast" coz the superlative form of fast is "fastest." MF in Chess is "Master FIDE," and "Master Fighter!" how to join team and enter?